Since February, I've been methodically going through different breakfast cookie recipes. Most of them are either too blah and banana-y or really good, but should be saved for dessert. I tried my best to come up with something that balanced both: I want to enjoy it like a cookie, but know that it's packed with good stuff. I ended up using a LOT of ingredients to achieve this perfect breakfast cookie, hence the name. Also worth noting, I used a chocolate peanut butter in this batch, so they're a bit darker brown. The recipe yields 16 good sized cookies. They can get a bit damp and sponge-y in the fridge or on the counter, even if you keep them in an airtight container. So after they've cooled, I just freeze them in a big Ziploc bag and pop one in the microwave for about 20 seconds. Added bonus, who doesn't love a warm cookie? Mix-ins should equal a cup or so. Here's the combination I use, but you can change it up however you like with different dried fruit, nuts, etc. Preheat oven to 350 degrees. In a bowl, mix flour, almond meal, oats, salt, baking soda, cinnamon and flaxseed together. Set aside. In a large bowl or stand mixer, whisk egg and sugar together until smooth. Add in vanilla and bananas - I just throw them in whole and let them get mashed in the mixer. Add the melted and cooled butter, honey and nut butter. Mix until combined. Gradually add in dry ingredients and mix until just combined. 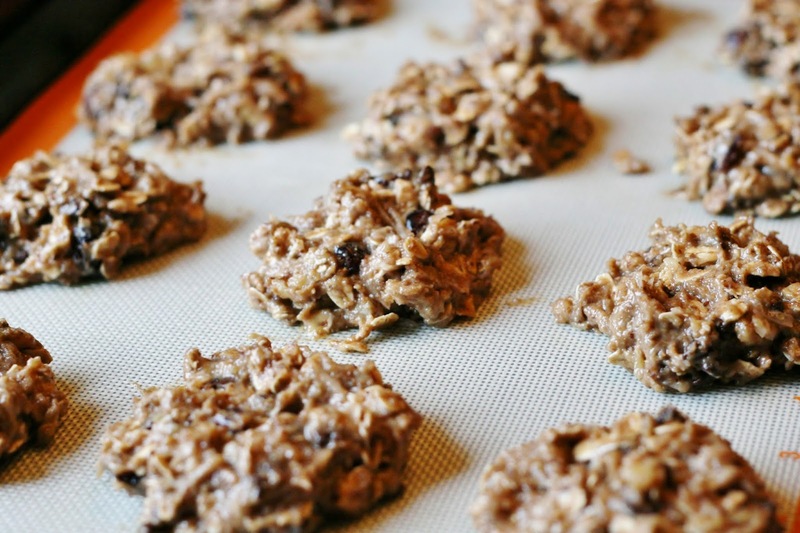 Lastly, put in your 'mix-ins' like the chocolate chips, dried cranberries, walnuts, coconut and sunflower seeds. drop dollops (about 1/4 cup each) of batter onto a nonstick baking sheet or silpat mat, placing them about an inch apart. Bake for 12 minutes, or until set and lightly golden around the edges. 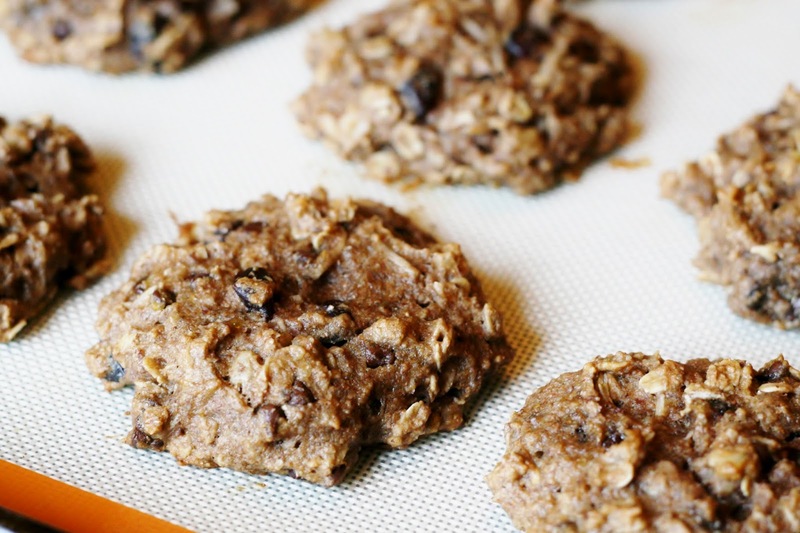 I love breakfast cookies especially when I make them as a hodge podge of my favorite ingredients. Yum.